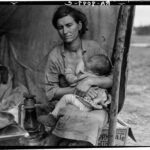 The Migrant Mother is the iconic image of the Farm Security Administration’s decade-long project to create a visual documentation of life in the U.S. following the Great Depression and under the New Deal. 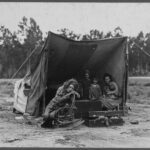 The more than 170 thousand negatives have been scanned and the FSA/OWI Black-and-White Negatives are all available online – an overwhelming act of photographic generosity. 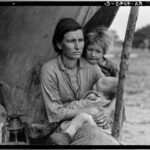 A photographer’s negatives are a lot more than the physical embodiment of images, they show us how a photographer notices and approaches a subject. It’s the record of a thinking process. 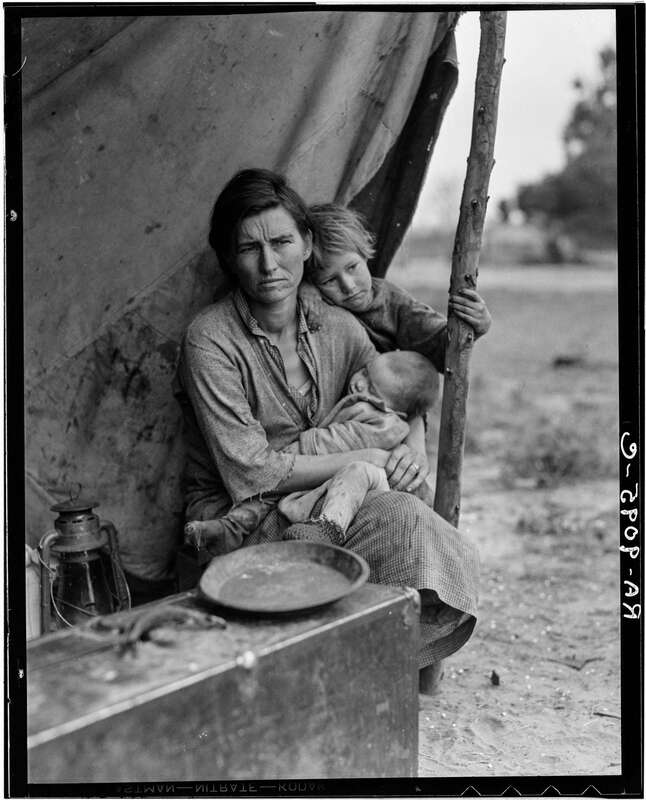 We know from Dorothea Lange that she took five shots on black-and-white, nitrate (highly flammable), 4″x5″ negatives. In an era of hurried and mindless digital snapping it’s a fantastic reminder of how a real photographer works. The key is distance. With a prime lens (i.e. a lens with a fixed focal length and therefore magnification) the only way to make a subject “bigger” is to move physically closer. The omnipresent kit zoom lens that comes with most digital cameras by default these days makes people forget that perspective only changes if they physically move. 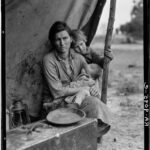 When it comes to portraits with physical proximity comes an emotional intensity that photos taken from afar with a telephoto lens cannot match. 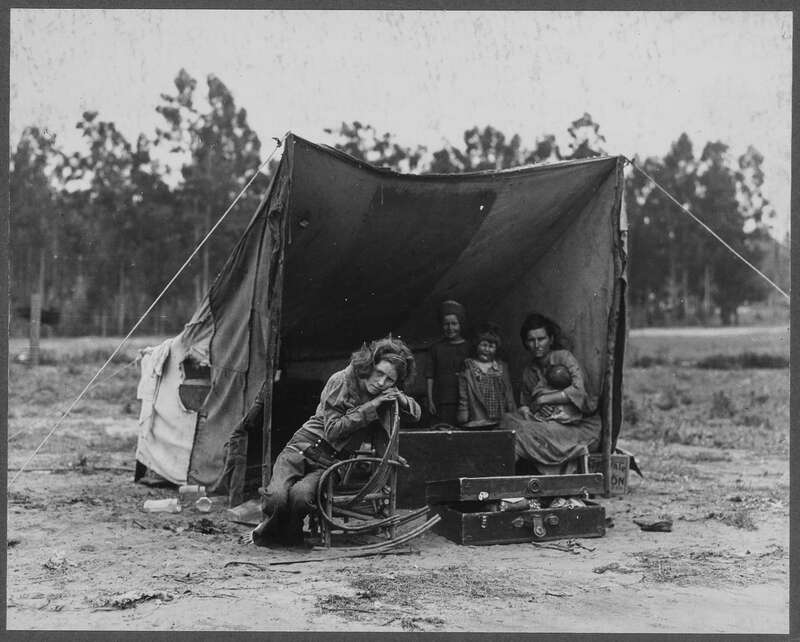 The first image is a wide shot. It is beautiful. It shows five people and tells the viewer the context. Most people would walk on after this first image. Perhaps out of shyness, respect or fear. Distance also means communication. The closer you get, the more involved you’re getting. The next two shots take us closer. This is a cinematic decision, it is equivalent of the camera dollying in. Not much time passes between these two images, but there is a change of orientation, one image is in landscape format, the other is in portrait mode. Two more powerful shots that leave you speechless. But Dorothea doesn’t leave. It’s the storyteller’s instinct telling her that this story hasn’t yet been written. Many would pack up and move on, she stays. 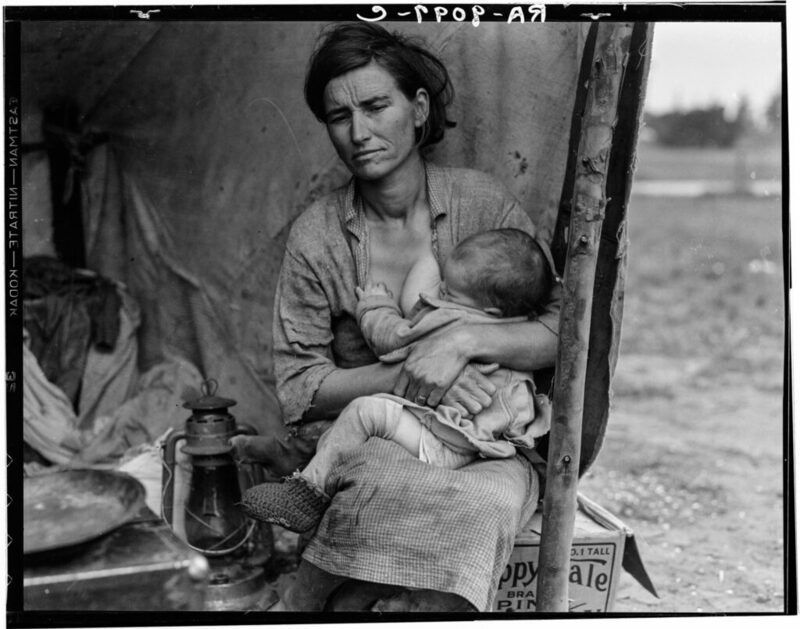 The mother, Florence Owens Thompson breastfeeds her youngest child. An intimate moment that takes us physically another step closer (just watch the framing) and leaves no physical (or emotional) room for any of the other four children. But apart from telling a story, there is something else going on in Dorothea’s mind. She is playing with composition. The camera is again in landscape mode. Another crucial lesson: it’s never over until it’s over. She senses what’s happening in front of her but instinctively or not, her mind is searching for the perfect solution. And that means seeing the rest of her composition. She is not done yet, she is glued to the scene, unable to leave. And then she takes the final, perfect shot. The previous four were in a way just a prelude, research. 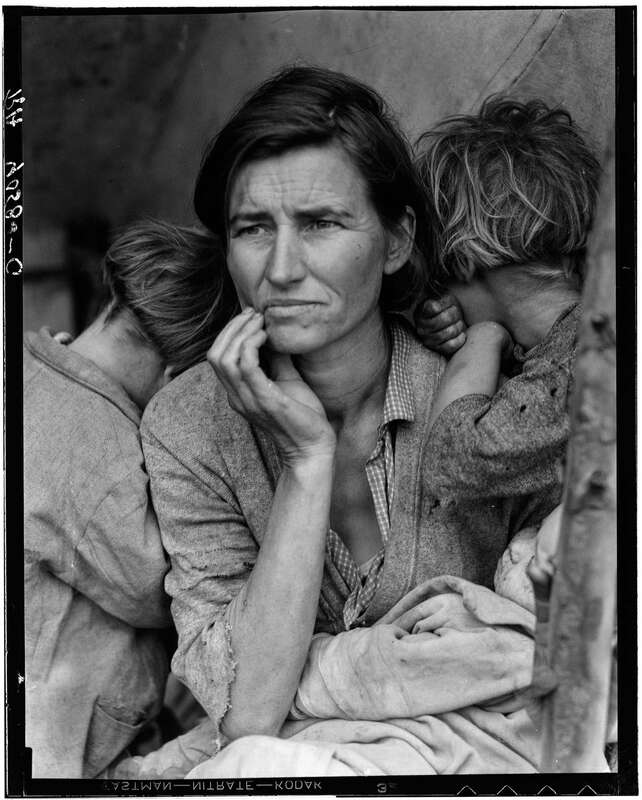 She finds the perfect distance: she is as close as she needs to be to capture the Florence’s essence: a mother with a sleeping child and two children whose faces we do not see. It’s impossible to tell anyone how to take a great image. That is genius which I increasingly think is a readiness of certain minds to react almost instantly to perfection and an ability to perceive the essence of an event as it is happening. 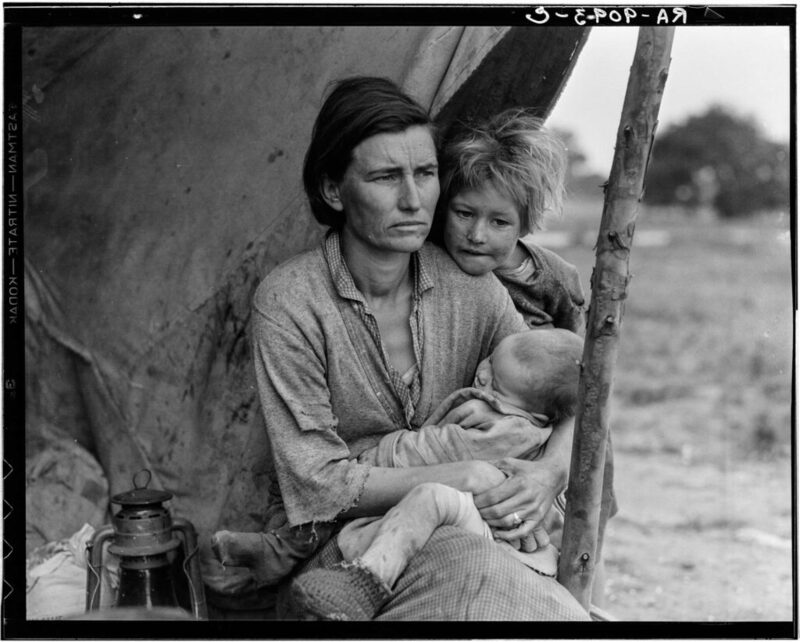 Great photos (like other creations of art) have an astonishing economy of expression. The composition contains everything that it needs to tell the story but no more. The fifth image is this perfect image. There is no need to describe it, it’s an image, you look at it and you see it. But the story of these five shots show how genius needs a method – a method that we can all learn from. First, perception. Seeing the potential for an image. Obeying the desire to start taking pictures. Second, being technically ready. All the ‘nonsense’ about aperture, shutter speed, sensitivity, metering light is second nature. It can be detailed technical knowledge or just an intuitive act of getting your settings right, it doesn’t matter. But the camera needs to be an extension of your eyes, it cannot be an obstacle. Third, an almost sacred sensitivity to distance. Getting closer and closer. Reacting to the person who is in front of you. A careful, tactful, slow approach. Knowing that you can’t start with the dramatic close-up. You have to wait. And perhaps it is this, that most digital photographers need to remember. Patience. Waiting. Allowing the image to come to you at its own leisure as opposed to trying to force it by the incessant depression of the shutter release. If you want to scroll through all five images, here’s a gallery where you can do that.